Alex Casassovici: Azarus is a game challenge network. The idea is to let every player define and run their own challenges on their own terms. 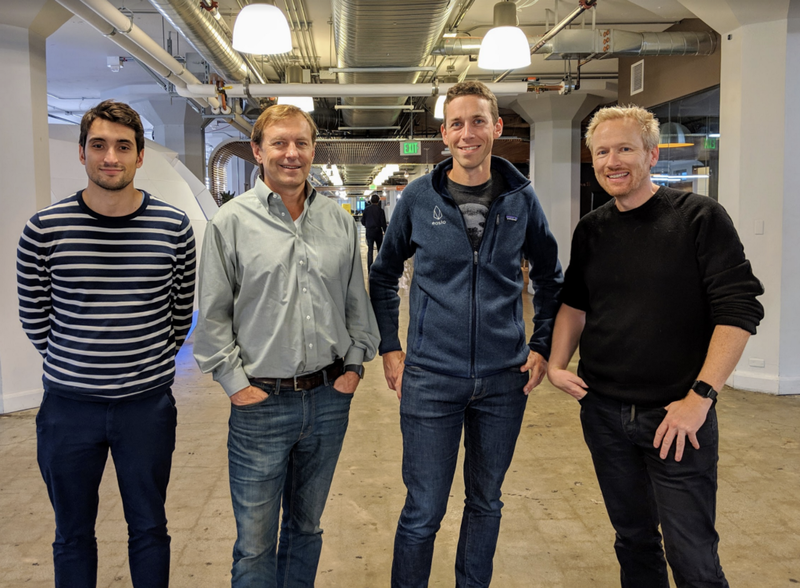 We have been working with publishers to get access to the best possible sources of data, letting us know what happens in games in almost real-time. This data is then “oraclized” to feed smart contracts that operate the challenges. Alex Casassovici: When we started working on Azarus, the whole team aligned quite quickly around a thesis: “challenges” are the language of the gamer. Sixteen years ago, Xbox Live defined the first achievement network, later copied by Sony, Steam, Apple, and Android. Yet, that first step has aged as there is only so much that players will do for trophies. Games have been changing drastically from titles sold in retail boxes to long-lasting “live” games. In that context, retaining users is at least as important as acquiring new players. We realized that challenges wield an untapped power: to let players have even more fun with games they already love by putting some skin in the game. We also recognized that whatever we do must be done in partnership with publishers. Alex Casassovici: Our founding team, based in San Francisco, is comprised of seasoned gaming executives and entrepreneurs who believe blockchain will redefine relationships between game publishers and their customers. I’m Alex Casassovici and I’m a technologist and engineer who has built several companies around data telemetry and analysis. Andrew Lacy is a serial entrepreneur who has founded and led many successful startups, including Tapulous. Erik Whiteford is a seasoned game publishing executive who has led marketing efforts for brands including EA Sports, EA Games, 2K Sports, and Wargaming. Benjamin Devienne is a former academic researcher who has worked for EA, Ubisoft, Gameloft, and Facebook. Alex Casassovici: We went live for a first alpha-test in late September in partnership with Ubisoft on their flagship title Rainbow Six: Siege. 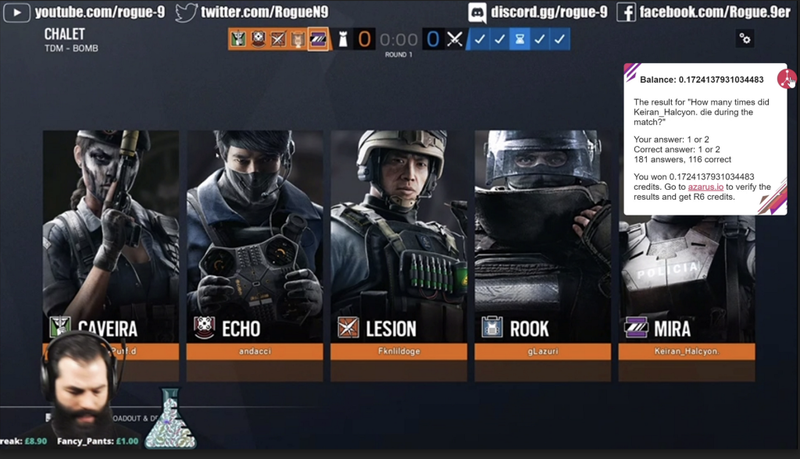 Ubisoft designed and funded challenges, rewarding viewers watching Twitch streams while paying great attention to what was happening in a match. At the end of each match, a challenge would be generated, firing off a question on the viewer’s screen through a Twitch Extension running on top of the stream. The question would focus on a specific statistic, and viewers with the right answer would split the AZA credit pool set by the streamer. AZA credits can then be exchanged on azarus.io for in-game items. That first test was a tremendous success, proving that the mechanics were capturing attention at unprecedented levels. Alex Casassovici: Shady sites have plagued the gaming universe for years, from fake codes and black market to illegal tournaments and gambling/betting platforms. In response, we built a platform that runs in the open, that’s sanctioned by publishers and that stays away from betting and gambling. Blockchain’s core value is to create trust across a group of people that have little to no reason to trust each other. Our AZA credit is a virtual currency, akin to the ones of actual games. It’s a measure of the time players spend on the platform and of their skills / understanding of the game. In that context, transparency means the platform works as a self-regulating community, with hundreds of users digging in the logs and debating over the rightfulness of the outcome. With EOSIO, users can interact with the blockchain without having to know how it works. That and its transaction speeds made it the best choice for us. Alex Casassovici: Block producers and exchanges have been very enthusiastic about the project. We’ve been working with some community members to help define the proper architecture that will allow us to move to the mainnet, as well as financial options to give us enough CPU / Bandwidth / RAM staked to support it. That support has been extremely helpful.